via email from Nicolas Champetier, 10-15-06 Did you know that Bert Hall had a French wife also ? The daughter they had is my grand mother still alive (the mother of my father). The funny thing is that I only heard a little bit about him when I was a child. I decided few months ago to seriously learn more about him. 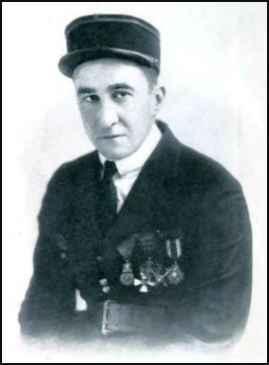 I’m in the French Air Force Reserve and I collaborated in the success of the 90th anniversary of the Escadrille Lafayette where he was in the WWI as a pilot in the Foreign Legion. If you need another picture of him, I have some from several books. via email from Nancy Franklin, 11-29-05 I have heard many stories in my family about a Birch Hall who was an aviator, but have never seen anything to substantiate these stories. He was born to my great great grandmother in Montgomery County Missouri. He was a very adventuresome fellow and had some dealings in China while in service. I find that there really was a Birch Hall and that he did some of the things she had told me about! In any event, I am now trying tolearn more about his life and career. My great-grandmother's mother was widowed and married Mr. Hall who had sons named George and Frank. She had previously been married to Mr. Bussemer, which was my great-grandmother's maiden name. Anyway, she even told me that he was connected to the Chinese military in some way. I wish I had paid more attention! Editor's Note: I thank Nancy for these bits of information about the family. I hope that someone will find this page on my site and be prepared to share more information regarding his life and career. I saw your stuff and the website for Bert Ball and was very suprised because my name is Christopher Hall and Bert was married to my grandmother Helen. She had three boys with him, my dad Don Hall, Norman Hall and Weston Hall, My uncles have all passed away, but I have two brothers and a sister and Bert was our grandfather. Like you we don't know too much about him. I would be interested in talking to you and sharing any info we might have. We do have some photos and things and you are family we never knew we had, so please write back. Hope you are well. Looking forward to hearing from you. Bert Hall lived 3 houses south of me in Castalia Ohio. In his later years he had a business in a small building behind the house called the "Sturdy Toy Company". A local lady, who passed away a couple years ago, told me she didn't like him since he hit her in the head while test flying one of his toy planes. This must have been in the late '30s or early 1940's. Another local lady, now in her 70's, has one of the toy planes in an original box. From what I've read he was killed in an automobile accident about 18 miles west of here. Just realized I have some familiarity with one of your early birds. I was born in the same town as Reinhardt Ausmus and a friend of mine's grandfather was a boyfriend of his widow. This must have been back in the 1960's. I think they lived on the same street, Boalt Street , in Sandusky Ohio. Just have a brief memory of Mr. Ausmus from my childhood. Maybe I can send you a photo of Bert Hall's house and his little foundry behind the house. The flotilla, including the craft piloted by Corporal Kiffen Rockwell, of Atlanta; Corporal Bob Davis, James Rogers McConnell, Victor Chapman, Sergeant Elliott Cowdin, of New York; Lieutenant William K. Thaw, of Pittsburg; Sergeant Norman Prince, of Boston; and Sergeant Bert Hall, of Galveston, started at daybreak and spent nearly two hours reconnoitering under a hot fire but encountered no German machines. ONLINE RESOURCES If you search for "Bert Hall," +aviation, using the Google search engine, (1-7-05), you will find about 159 links. Among the most helpful are the following. Escadrille Americaine This page on the USAF Museum website tells the story of the Escadrille Americaine, later renamed Escadrille Lafayette, which was formed early in WWI and consisted of seven pilots, including Victor Chapman. It offers photographs of Bill Thaw and Bert Hall, Kiffin Rockwell, and Victor Chapman. You can access the page by clicking on the title above. 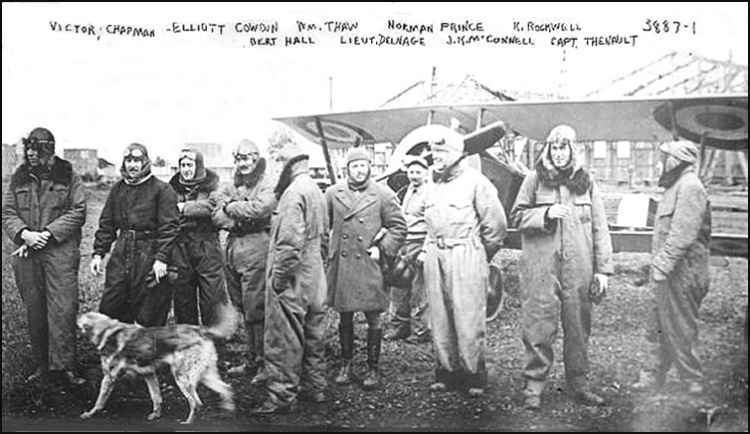 Bert Hall Hero or Heel This is a very extended series of messages on the Aerodrome Forum. It offers some facts about his life and career which are relatively unknown elsewhere. As an example, this message from "MUFF" is especially informative. 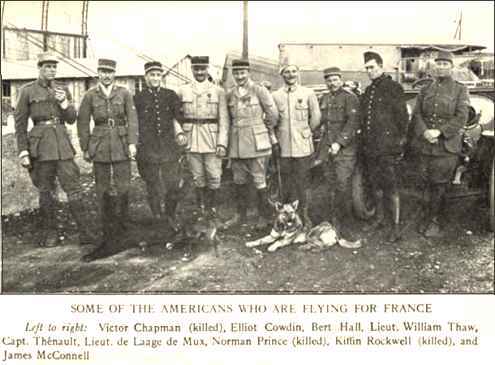 "The Man this thread is about is Weston Birch Hall (Bert) born in Higginsville, Missouri on Nov. 7 1885 and died Dec.6 1948. he was one of the first members of the Lafayette Escadrille along with William Thaw. and while some say Bert was a bit of a con man, He did lead a life that would sure make a great movie or Book. as Bert used to say " Them that like me like me well, them that don't can go to hell"
You can access this site by clicking on the title above.